The link between geomechanics and fluid mechanics is becoming increasingly important. Examples are numerous and include, for instance, the combined influence of discontinuities and water in slopes and excavations, water as triggering mechanisms for surface subsidence or movement, water supply and drainage for development, and urban development. UP's combined approach to these two important applied fields of geology make our graduates well equipped to address the mechanics of geological media in applications covering all subdisciplines of engineering geology, rock mechanics, soil mechanics, hydrogeology, vadose zone hydrology and environmental management. Requiring a bachelors degree majoring in mechanics and geology, entry is possible into an honours programme focussing in either engineering geology or hydrogeology. This cross-disciplinary approach make our graduates sought after in industry as is expected from the excellent reputation of the University of Pretoria. All persons involved in teaching or research in engineering geology and hydrogeology sit in the Natural Sciences 2 Building on the University of Pretoria’s main campus. Contact details are available on the individual staff content pages. For entry into an honours (HQESF level 8), an appropriate bachelors degree at HQESF level 7 majoring in geology and with groundwater (hydrogeology; geohydrology), engineering geology, rock mechanics and soil mechanics are required. Given limitations on the annual intake, a final year average incorporating all these subjects of 60% are additionally required. MSc and PhD programmes are offered with specialisation in either Engineering Geology or Hydrogeology. Both programmes are research-based, involving only a dissertation or thesis, and are offered at HQESF levels 9 and 10 respectively. Entry into the programmes depend on academic background, work experience and the proposed topic of research. More information is available under Postgraduate Applications. Engineering Geology is somewhat different to applied geology in that additional knowledge, education and training is required in the problems of the ground for engineering works, site investigation methods and the classification and behaviour of soils and rocks in relation to civil engineering, and therefore includes practical knowledge of soil mechanics, rock mechanics and hydrogeology (fluid mechanics). Applications of engineering geology generally relate to construction on and in (i.e. founding or excavation) or with (i.e. construction materials) geological materials, as well as the influences of geological, geomorphological and hydrological processes on construction and development. Hydrogeology, groundwater hydrology or geohydrology refers to the occurrence, distribution and movement of water below the Earth’s surface. The study of groundwater, therefore, incorporate both the fluid (water) and the medium through which it is flowing (rock, soil or any other geological material). Groundwater – as opposed to surface water – refers to all the water occupying all the voids in the subsurface and is subdivided into the saturated or phreatic zone and the unsaturated, aeration or vadose zone. The relevance of the study of groundwater is generally quantitative (e.g. water supply, safe abstraction, influences of pumping) and qualitative (e.g. contamination, remediation, drinking water). Environmental geology is a generic term related to two distinct subdisciplines. Firstly, ‘environmental’ can be seen to indicate the interaction between processes and Man, and include, for instance, risk induced by subsidence, slope movements, seismic events, hydrometeorology, and so forth. A second possible definition of ‘environmental’ relates more to the field of contaminant transport and focuses around chemical, physical, microbiological, radioactive, endocrine disruptive, organic and other forms of water and soil contamination. Specialisation in these fields are offered within the context of Engineering Geology or Hydrogeology, and often involves specialist input from Geology (e.g. quantitative mineralogy, economic geology, etc. ), the Water Institute (surface hydrology, soil science, meteorology, zoology, ecology, virology, etc.) and the UP Natural Hazard Centre (e.g. risk assessment, geostatistics, seismology, etc.). A developing strength in the department is focused around unsaturated or vadose zone hydrology. The area between the Earth’s surface and the groundwater table is characterised by pore spaces occupied with both air and water, and these dual-flow systems influence the movement of contaminants to the aquifer, water seepage through buildings and excavations, and govern the important interaction between surface water and groundwater as a fundamental component of the water cycle. Although included in the separate fields of engineering-, hydro- or environmental geology, the tendency is towards considering these as new disciplines focused around the application of water-air systems to development and the environment. The present economic growth and reconstruction of Southern Africa has led to large infrastructure and resource development programmes. The research focus in Engineering Geology and Hydrogeology provides opportunities to contribute to this development. Research in hydrogeology, including the characterization of pollution and groundwater flow into mines, the characterization and sustainable utilization of fractured aquifers in crystalline rocks as well as the vulnerability of karst aquifers, is contributing to the safeguarding of the precious groundwater resource. Presently, research is focussed strongly around vadose zone hydrology with interdisciplinary collaboration between hydrogeologists, geologists, hydrologists, engineering geologists, soil scientists, geomorphologists and geotechnical engineers. 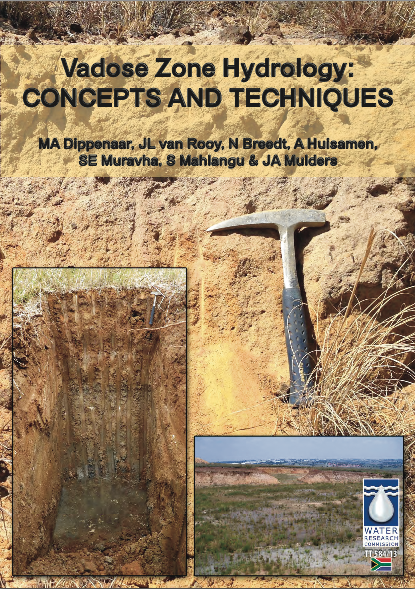 Engineering geological properties of soils and rocks, rock slope stability in open cast mines and the influence of geology on the Gautrain tunnels are aspects covered in engineering geological research. The long-standing association of the Engineering and Environmental Geology Section within the Department of Geology with dolomite stability has been maintained and extended to contribute towards the vulnerability mapping on karst aquifers; especially the surface stability issue if these aquifers are utilized as emergency water supply sources. Latest developments resulted in establishment of a strong research focus on vadose zone hydrology and engineering hydrogeology. Here, the unsaturated zone (comprising both soil and rock) is investigated with the emphasis of addressing the impact of partial saturation of earth materials on contamination, seepage, drainage and risk posed by land use changes and urban development. A cross-disciplinary effort in compiling specialist input from major disciplines in vadose zone hydrology to generate a single theoretical language, methodologies and minimum best practice guidelines. Establishing public awareness campaign of the importance of (ground)water in urban South Africa. Contributing towards a large database for research supersites established in the Kruger National Park through detailed geological mapping of bedrock, weathering profiles and hillslope processes. Hydrological characterisation of the impact of millions of litres of kerosene spilt into a fractured gneiss aquifer. A thorough investigation incorporating validation through case studies of the social and hydrological impacts of cemeteries and interments in South Africa. Utilising the geotechnical centrifuge and incorporating the detailed rock mechanical descriptions of fractured rock, aiming to better quantify unsaturated fracture flow. 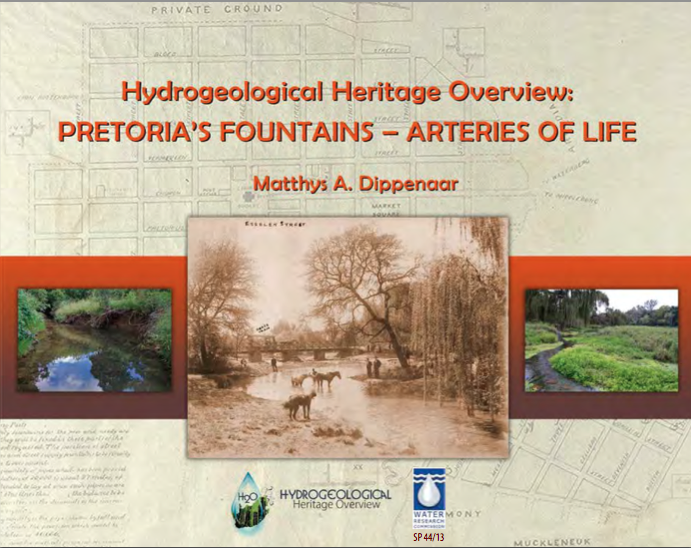 Improving the public appreciation and understanding of water science through a water history awareness campaign (book and documentary film) for major South African cities. Study of the formation of pedocretes such as calcrete and ferricrete, incorporating the hydrological and geomorphological impacts on the formation thereof.